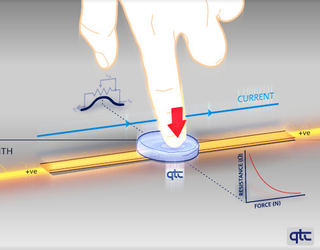 We've made the leap from resistive to capacitive touchscreens that are more accurate—and multitouchy—so what's next? Screens that feel how hard you tickle them. One of several approaches to making that happen uses a quantum tunneling composite—quantum tunneling happens when you bring two conductors close together, but with an insulating layer still between them, and electrons jump between the two conductors. Peratech's way to do this is with a polymer that changes resistance as you apply force for the insulating layer, so that bottom line, screens using this tech can tell how hard you pressing on the screen, since the sensors are able tell within two micrometers of how far in the screen's bending.